If you ask Charlotte locals what the biggest growing industry is in town, there is a good chance that they will say beer and craft breweries. 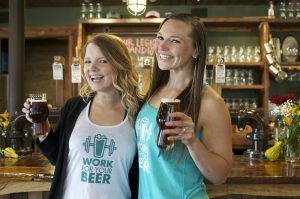 Being an active city with great weather has led to many of these breweries and pour shops starting fitness programs to attract those that like to “earn” their beers. The one thing missing from this community was a central location where people could see all of these events. Hence, Work for Your Beer was born. 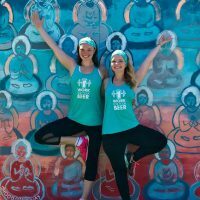 Alicia Thomas and Melanie Fox launched their website the first day of December 2016 to provide an all-inclusive resource for beer fitness in Charlotte. 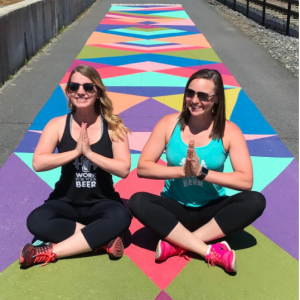 Their project has only been growing with now over 75 recurring fitness events occurring at breweries, bottle shops, and other locations each week. These events range from yoga classes, run clubs, bootcamps, and, you guessed it, bike rides. Their goal is to help Charlotteans live a healthy, balanced lifestyle and to build a sense of community at the same time. When it came time to start their fundraising, it was an easy decision to use all of their compiled data about beer-fitness and formulate a plan on how to use some of these events. This May, Alicia and Melanie launched their campaign, a 31-day fundraiser for the 24 Foundation. “Every day of the month, we go to a different beer fitness event happening at a brewery, bottle shop, or other beer-serving location in Charlotte.” They then raffle off a gift basket, valued around $100 and donated from each venue, through tickets they sell, letting people purchase as many as they want. 100% of their proceeds go to their team fundraising! “We raised more than $500 in just two weeks, and we’re aiming to have over $1,500 before the end of May! By the time that we get to the event in July, our goal is to grow our team to 20 members and raise $5,000.” After May ends, the two will continue sharing their team’s page to social media followers and in their “Weekly Brewsletter” emails to continue fundraising and hopefully adding recruits. For their initial recruitment, they started by reaching out to friends and family, as well as their Work For Your Beer squad, including the founders, Director of Partnerships, interns and volunteers. This also includes their entire audience of over 15,000 active beer-lovers here in Charlotte. They want to emphasize that their team is open to athletes of all levels, from beginner to expert and everything in between. They also will not discriminate based on preference in beers! We would like to thank Alicia Thomas and Melanie Fox for joining the cause and for all the work they are doing for their community.